That came across as a surprise to me, because I’ve always believed myself to be a very positive person. After much thought and searching, I realized I WAS complaining about how cold it was and about how I forgot my watch and about how much we had to walk. Those were real feelings and thoughts. Now… if I could go back, would I do it again? Would I take the risk to appear “negative” so that he wouldn’t think bad of me? ABSOLUTELY!!! I would absolutely say the same things and “complaint” just as much. In a negative world, we could use more positivity and most people are nowhere near as positive enough as they should be and could be. People focus a lot on the negative outcomes and on the “worse case” scenarios. Parents focus on their child’s bad behavior. Spouses focus on the traits the partner does not have. Women focus on how “not skinny” they are and men on how many muscles they need. ALL THE TIME. When I coach, I am often having to remind my clients how far they’ve come, because if I let them, they’ll rant the entire call about what they haven’t done. With that said, I will also say “TIMED COMPLAINING” is important too. People don’t express their real feelings enough. People have gotten used to “swallowing” their emotions and thoughts. They share their inadequacies only for future affirmation of the person listening, but not for a solution. Moms don’t share the reality of how tired they are in managing the house and if they go deeper… of how lonely it feels. Dads don’t express the feeling of the rat race to provide for their family and how much pressure they feel in the thought of having to make money day in and day out. Children swallow the feelings of being too controlled by parents and friends don’t say how hurt they are when they are not valued. Pastors are stuck helping everyone be better when their own life is being lost and they do it quietly. All these people “swallow” their negativity. The “wanna be” positive crowd keeps their negative thoughts to themselves, while inwardly the monster of oppression is eating them alive, with no shoulder to cry on and always appearing strong to everyone. 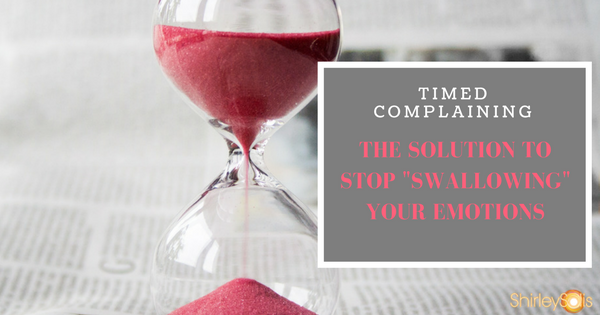 With “timed complaining,” I allow myself the release of negative emotions and thoughts, knowing it’s just for a moment. Just like there are fart and burp releases, the emotions need release (yes, I did just say that!). We can’t always be positive and we shouldn’t always be negative. It is possible to just be our healthy selves, sharing what is and what isn’t. I can be positive when the situation calls for it and you can be “negative” when there is a need to release and let go. Self control and self awareness is key. Being real with emotions is important, as long as we know how much is too much when it comes to the negative side of things. The only person who knows your gauge for positivity and negativity is you. Maybe you are “swallowing” lots of emotions and if you allowed some healthy release, you’ll feel lighter and more authentic with yourself. Perhaps, you are too negative and you’ve noticed it doesn’t suit you, well it’s time for a change. Either way, balance and personal awareness is important in both. Don’t be Debbie Downer or Negative Nancy, but don’t let your identity be centered around how “positive” you are either. Be real and be healthy. Be you.